This article is a list of countries by the number of road motor vehicles per 1,000 inhabitants. This includes cars, vans, buses, and freight and other trucks; but excludes motorcycles and other two-wheelers. The People's Republic of China has the largest fleet of motor vehicles in the world, with 332 million motor vehicles in 2018 including 235 million cars, and in 2009 became the world's largest new car market as well. In 2011, a total of 80 million cars and commercial vehicles were built, led by China, with 18.4 million motor vehicles manufactured. 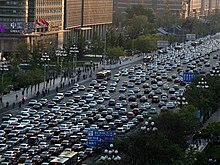 ^ "China car population reaches 235 million units, Ministry of Public Security". Autonews.gasgoo.com. Retrieved 23 March 2019. ^ "Automobiles and Truck Trends". Plunkett Research. Retrieved 2011-08-18. ^ John Sousanis (2011-08-15). "World Vehicle Population Tops 1 Billion Units". Ward AutoWorld. Retrieved 2011-08-27. ^ John Voelcker (2012-03-29). "80 Million Vehicles Built Globally Last Year - A New Record". Green Car Reports. Retrieved 2012-03-29. ^ a b c d e f g h i j k l m n o p q r s t u v w x y z aa ab ac ad ae af ag ah ai "World Bank Data: Motor vehicles (per 1,000 people)". The World Bank. Archived from the original on February 9, 2014. Retrieved 2014-02-09. Archived. ^ "Number of motor vehicles registered in the United States from 1990 to 2017 (in 1,000s)". ^ a b c d e f g h i j k l m n o p q r s t u v w x y z aa ab ac ad ae af ag ah ai aj ak al am an ao ap aq ar as at au av aw ax ay az ba bb bc bd be bf bg bh bi bj bk bl bm bn bo bp bq br bs bt bu bv bw bx by bz ca cb cc cd ce cf cg ch ci cj ck cl cm cn co cp cq cr cs ct cu cv cw cx cy cz da db dc dd de df dg dh di dj "total no of vehicles". Gov.uk. ^ "Passenger cars in the EU - Statistics Explained". Ec.europa.eu. Retrieved 2018-09-08. ^ "World Vehicles In Use All Vehicles" (PDF). Retrieved 2016-02-19. ^ "自動車保有台数に関する統計情報" (PDF). 日本自動車整備振興会連合会. Retrieved 2017-11-01. ^ a b "Passenger cars in the EU - Statistics Explained". Ec.europa.eu. Retrieved 2019-03-13. ^ "כלי רכב מנועיים 2016" (PDF). Israel Central Bureau of Statistics. ^ "כלי רכב מנועיים 2017". Israel Central Bureau of Statistics. ^ "ЕМИСС". Fedstat.ru. Retrieved 14 April 2019. ^ "Frota de Veículos - 2018" (in Portuguese). DENATRAN (Brazilian National Department of Transit). Retrieved 28 January 2019. ^ a b "Motor Vehicle Registration". Ministry of Transportation and Communications, R.O.C. ^ "Montenegrin statistical office, 2017" (PDF). Retrieved 2017-11-13. ^ "Serbian statistical office, 2017" (PDF). Retrieved 2017-11-13. ^ a b c d e f g h i j "Motor vehicles (most recent) by country". Nationmaster.com. Retrieved 1 April 2012. ^ "China's car population grows up to 240 million units by the end of 2018". Autonews.gasgoo.com. Retrieved 23 March 2019. ^ "Nauru General Data". Populstat.info. Retrieved 2012-06-02. ^ "Motor vehicles (per 1,000 people)". Data.worldbank.org. Retrieved 2014-11-03. ^ "MOTOR VEHICLE POPULATION BY VEHICLE TYPE" (PDF). lta.gov.sg. Retrieved 2019-04-15. ^ "Grenada General Data". Populstat.info. Retrieved 2012-06-02. ^ "865 شخصاً". Al-akhbar.com. Retrieved 23 March 2019. ^ "ANDEMOS advierte sobre el envejecimiento de la población vehicular en Colombia". Andemos.org. Retrieved 23 March 2019. ^ "¿Cuántos somos?". Dane.gov.co. Retrieved 23 March 2019. ^ a b c "Iraq Motor Vehicle Registered [2005 - 2019] [Data & Charts]". Ceicdata.com. Retrieved 23 March 2019. ^ "Road Transport Data (Q1 2017)" (PDF). Nigeria: National Bureau of Statistics. 2017. Retrieved 2019-02-12. ^ "Uzbekistan General Data". Populstat.info. Retrieved 2012-06-02. ^ "India Motor Vehicle Registered [2005 - 2019] [Data & Charts]". Ceicdata.com. Retrieved 23 March 2019. ^ a b "Myanmar Motor Vehicle Statistics". Ceicdata.com. Retrieved 23 March 2019. ^ "Gabon General Data". Populstat.info. Retrieved 2012-06-02. ^ "Equatorial Guinea General Data". Populstat.info. Retrieved 2012-06-02. ^ "North Korea General Data". Populstat.info. Retrieved 2012-06-02. ^ "Number of Vehicles in Ethiopia". 2merkato.com. ^ "Lesotho General Data". Populstat.info. Retrieved 2012-06-02. ^ "Solomon Islands General Data". Populstat.info. Retrieved 2012-06-02.